All hail Steve, Lord of the Sword! Dragon Quest IX: Sentinels of the Starry Skies is one of the biggest games on DS, but you may not realise exactly how big until you read this. Committed player Steve Tolin has seen all there is to see in the Square Enix RPG: he's defeated every enemy type, grabbed every item and piece of clothing and found every Alchenomicon recipe too. 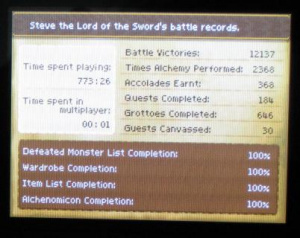 He's finished all the downloadable quests and has done it all in single-player mode. How much time does such a mammoth undertaking require? Tolin clocked the game at a remarkable 773 hours or 32 days of gameplay, with only a single minute spent in multiplayer, presumably by accident. Interestingly, Tolin is also the owner of game developer Deep Fried Entertainment, whose game Shadowplay hit WiiWare last year. Now that's a massive amount of content, although I'm curious to see how much of that time was spent just on grinding and not doing anything really interesting. I spent over 80-something hours playing Mario Galaxy 2 (and have over 100 stars), but that didn't stop others from completing it 100% in a lot less time. Maybe I enjoyed it more. Lol, 00:01 spent on multiplayer. I like the fact that a video game developer accomplished this. So finally a for him. Still waiting for ShadowPlay in Europe though. Really want that game. You know what i'll be playing on my 3DS between big game releases. @bruinj04: 100%'ing Okami takes about 70 hours tops. It's not that hard to do. And yes, I am counting finding every animal, every type of treasure, every brush skill, all the stray beads... and so forth. 100%ing DQIX, on the other hand... probably would take about 800 hours, lol. In truth, he must e very dedicated so well done you - but I would find doing that so frustratingly boring. I put about 10 hours into it...man he's really dedicated. is he the first person to do this? He must have like 3 girlfriends. Damn that's INSANE! I think the max I've spent in a game is just over 100 hours, and the only games I've ever managed to do that are in Advance Wars DS, Animal Crossing Wild World, and WarioWare DIY (All DS games, coincidentially ). I can't imagine spending 7x that much on a SINGLE game. For those people giving any negativity towards this... realize that this is a GOOD thing. It just shows how much content is within the game. I myself haven't gotten anywhere near 100% - to ace it is beyond awesome for them. Seriously, if you haven't gotten the game and you're into RPGs, I'd just wonder why you haven't gotten it yet. Seriously, especially you briunj04! I love Okami myself, but seriously? You really think getting 100% is that tough? Unless you beat the main storyline without stopping, doing the sidequests is hardly anything amazing... there's like a million other games with more content than Okami. Also albc5023, it's not like he did it all at once. Considering that it's both an RPG and a handheld game - I seriously doubt he did this for weeks on end. He more than likely spread it apart throughout the years. Thats something I could never do play one game for 773 hours. I would get fed up with playing just one game for that long. Now time for him to start a new game and beat his time! My god, I can only imagine a speed run. Yeah, that's why I don't have the game. I hate customizing, and I'm a perfectionist who still doesn't have everything in Animal Crossing WW and spent 168 hours in Pokemon HeartGold and barely have all the pokemon. Screw these long games, I've got real life responsibilities to manage. It's gotten to the point where I have unopened games and many others only played for 10 minutes or so. I remember saying I'd do that some day. Seems as it takes 770 hours, I'll pass on it. I still 100%ed TWEWY, which only took 300 hours. man i put like 110 in I think and had a pretty good chunk of content found. Still--I imagine getting all those recipes took hundreds by itself, esp. if he wasn't walkthrough-ing/FAQ-ing everything and had to figure out efficient ways to farm items himself. I have put in 44 hours into the game. No way close to 773. The 1 minute spent in multiplayer is because there's a certain item you can only get by playing multiplayer at least once, otherwise you'll permanently be stuck at 99%. I'm getting super close to matching this guy's efforts with higher numbers in some areas even, and have logged 626 hours (it's weird to think that a huge chunk of that timewas spent while walking to/from work). The last step to getting 100% in everything involves farming colorful orbs that have rage-incuding annoyingly low drop rates, and I just don't think I can bring myself to do it anymore. I'm kind of ashamed at how addicted to this game I became, but it is somewhat comforting knowing there are others out there like me. So he played the game about 2 hours every day since it was released. Now that's real dedication here. This would have been a great game when I was a kid and didn't have that many games. These days I would give up much much sooner despite being a completionist.